Greetings! Pushparayan, the other 12 friends and I have become weaker and tired; but we are still able to sit up and talk to people. Today is the seventh day of the indefinite hunger strike. Nobody from the State Government or the Central Government has bothered to come and see us or talk to us. A medical team came to check our health day before yesterday (March 23) but no public health officials came and offered any help even though some 10,000 people have been congregating here at Idinthakarai every day since March 19th. Our friends from Idinthakarai have been cooking some simple meals for all these people and most of the people are sleeping here as there is the prohibitory order of 144 still in effect. They are scared of going out of this foot-ball stadium sized space in front of the St. Lourdes church. The police are waiting for me and Pushparayan to collapse so that we would go to an hospital for treatment and they could arrest us there. How cruel and anti-people our governments could become! In the meantime, the Tamil Nadu government has convened a meeting of some 13 Panchayat (local body) leaders to plan to distribute the 500-crore package the government has announced for the victims of nuclear development. The state police continues its crack down; they tried to arrest three men at Koodankulam and they ll managed to give a slip. The police go to some of the coastal villages and order them to go fishing in order to create a pictue of normalcy in the area. They also ask them not to carry any food by boat to Idinthakarai and threaten them with cases if they did. People defy this kind of intimidatory exercises. This is a struggle (but ‘war’ in the eyes of our opponents) between rich, famous, powerful, upper-class and upper-caste pro-mega-development folks and poor, unknown, powerless, lower-class and lower-caste pro-sustainable development masses. The governments here work for the profit of Russia and not for the people of India. The governments engaged in massive power cuts over the past few months in order to create a huge hatred against us and opposition to our struggle. Now that they have resumed work at the Koodankulam plant, the officials say they do not know how long it will take for electricity generation. Now people of Tamil Nadu know that Koodankulam is not the answer for our power crisis. The people of Tamil Nadu and India will wake up to many such realities soon with regards to Pechipparai dam water, reprocessing plant at Koodankulam, weapons facilities, atomic bombs etc. India is a highly- and densely-populated country and even a small mishap at a nuclear facility will create such a havoc and meyham for millions of people and jeopardize the survival and wellbeing of millions and millions of our brothers and sisters. We are not against the progress of our country and state but we feel that such a progress should be longstanding and sustainable for our future generations also. We have no moral authority to poison the resources of our future generations in order to produce electricity for us for 40 years. We say that let India be a world leader with creative and original ideas an d programs rather than the slave of Russia, United States and France. The governments here are taking up a new weapon now and that is our alleged links with Naxalites (Maoists). They are fabricating evidences and concocting conversations to establish that we have connections with Naxal youth and trying to portray us as a violent group. The whole world knows that we have been struggling for the past eight months in a nonviolent manner with absolutely no violence or terror. They will fail as they have in the “foreign hand” and “foreign money” accusations. The governments are desperately trying to provoke our people to prove their theory that “ordinary citizens” of our country do not have a mind of their own; they cannot think for themselves; they cannot stand up for their rights and entitlements in a nonviolent noncooperation cmapaign; and most importantly, these fishermen, Nadars, Dalits, Muslims, women and children are all dispensable for the growth of the Chennai-based and Delhi-based multi-billionaires. Well, that is the logic of globalization and that is what we vehemently oppose. 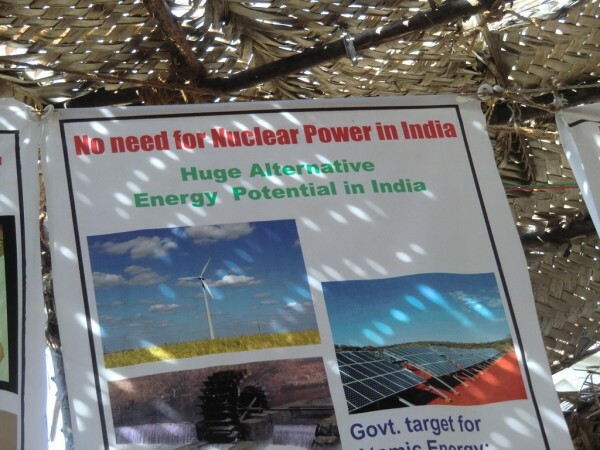 People power or nuclear power? Moral power or money power? Citizens’ power or State power? Which side you are on? The people of Tamil Nadu, and the people of India, please think of this!